Classic round shape, double bridge and full metal, an iconic in every sense. 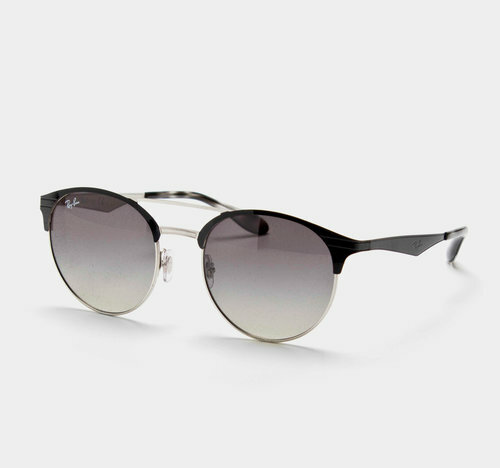 Introducing the Ray-Ban 3545 900411 54 Top Black Sunglasses in Black and Silver. These Ray-Ban sunglasses take the classic round shape and bring it into today's world with a double ridge. The frame is simple yet timeless and is completed with grey gradient lenses, you can expect mirror lenses, a guaranteed 100% UV protection along with ultra clear vision. Smartly presented with a black and silver frame with a perfect finish, these Ray-Ban sunglasses come complete with their own stylish carrying case so you can be prepared for any occasion, indoors or outdoors.